Princes and aristocrats in Europe had collected Japanese lacquer with enthusiasm since the seventeenth century. By the 1750s the skills necessary to re-shape panels of lacquer to create more fashionable objects were finely developed, particularly in Paris. The production of such pieces was controlled by the marchands-merciers (dealers in luxury goods). They were generally richer than cabinet-makers and it was they who laid out the capital to buy the expensive materials which were fashioned into furniture by the cabinet-makers. Baumhauer was one of many cabinet-makers from the German states who came to Paris, drawn by the opportunities offered to fine craftsmen by the strength of its luxury market. He made a number of commodes of this pattern, some of which bear the trade label of the marchand-mercier François-Charles Darnault. The flowing rococo mounts are cast with naturalistic flowers amongst sinuous scrolls and are among the grandest ever used on lacquer furniture of the rococo period. The commode is of serpentine, bombé form. It is raised on four tall legs of cabriole form. The commode is fitted with two drawers. The carcase of oak is veneered with panels of hiramakie (low relief) and takamakie (high relief) Japanese lacquer, which is overpainted and additionally embellished with Vernis Martin, the French painted decoration that imitated lacquerwork. The lacquer is set à travers, the scenes uninterrupted by the horizontal division between the drawers. The panels were probably cut from a cabinet.The composition of the front of the commode from three narrwo panels is disguised by a framework of gilt-bronze mounts of rococo scrolls and flowers, which creates a vertical division of the decoration on the front of the commode into three sections. The panels on the sides are individually framed in similar mounts. On the frame elements and the legs, the carcase is veneered with fruitwood as a ground for decoration in black Vernis Martin. 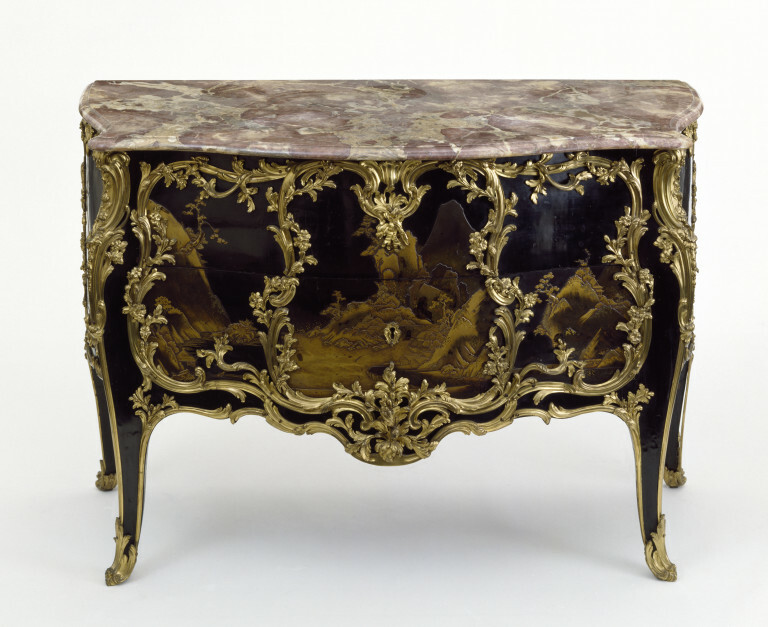 The commode is fitted with a slab of rouge de Villefranche (possibly Languedoc) marble, shaped and with a moulded edge. The back and sub-top of the commode are of frame-and-panel construction. The commode is stamped on the top of each front stile with the stamp carrying the name 'JOSEPH' between two fleurs de lys. A number of commodes of this model survive. A slightly more ambitious version in the J. Paul Getty Museum, Los Angeles (inventory no. 55.DA.2), bears the label of the marchand-mercier François-Charles Darnault. It was common practice for the lacquer for such a piece - a heavy investment - to be bought by a marchand-mercier (dealer in luxury goods) and supplied to the cabinet-maker whom he commissioned to make the piece. It seems likely that Joseph Baumhauer produced the whole series of similar commodes for Darnault. Darnault started his working life as a specialist mirror merchant, following the trade of his father, but by 1751 he was claiming on his label that he could supply the full range of luxury goods in which marchands-merciers traded, including clocks, lacquer-mounted pieces and gilt-bronzes. We know nothing of this history of this piece before it entered the collection of John Jones, at some time between the 1850s and 1882, when the bequest of Jones's collection came to the Museum. Joseph Baumhauer (usually referred to simply as 'Joseph') was, like many of the best Parisian cabinet-makers of the middle of the eighteenth century, an immigrant from Germany. He arrived in the French capital before 1749 and although he never became a master cabinet-maker in the guild of cabinet-makers (ébénistes), in about 1749 he was appointed marchand-ébéniste privilégié du roi (a seller of fine furniture under the patronage of the king). He never seems to have worked for private clients but instead made furniture that was supplied to a marchand-mercier (a dealer in luxury goods). These merchants controlled the market in luxury materials such as lacquer and porcelain, which were used in highly inventive ways to create new, highly luxurious pieces of furniture. Joseph worked for at least three merchants at different times - Lazare Duvaux and François-Charles Darnault (for whom he made this piece) and, in the 1760s for Simon Philippe Poirier, for whom he also made porcelain-mounted furniture. In the 1750s, Joseph specialised in pieces veneered with Japanese lacquer, or with floral marquetry, often producing the same shape with different decorative treatments, but with the same, lavish gilt-bronze mounts. Joseph was succeeded by his son Gaspard-Joseph Baumhauer, who continued to use the same mark, although he produced pieces in the new Gout Grec (literally 'Greek taste', i.e. neo-classical style). Wolvesperges, Th. Le Meuble Français en Laque au XVIIIe Siècle. Paris: Les Editions de l'Amateur/ Editions Racine. 1999, pp. 268-272, fig. 136. Kjellberg, Pierre. Le Mobilier Français du XVIIIe Siècle. Paris: Les Editions de l'Amateur. 2008, pp. 490-495, fig. d.
Pradère, A. French Furniture Makers. The Art of the Ebéniste from Louis XIV to the Revolution. London: Sotheby's Publications, 1989, pp.231-246. The mark Joseph was used by Joseph Baumhauer who was granted special privileges by the king in 1767. This may account for the presence of the fleurs-de-lys on his stamp. 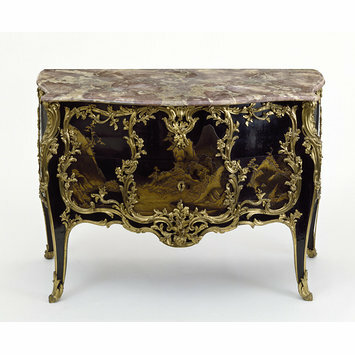 This is rather a late example of a commode in the Rococo style. This stamp was used by Joseph Baumhauer (d. 1772), who was granted special privileges by the king in 1767 but who seems previously to have worked for the marchand mercier (dealer in luxury wares) Darnault and possibly even collaborated with the ébéniste Bernard van Risamburgh II, which may account for the general similarity between the two commodes shown here. 1755-8 is the date suggested for the commode by Wolvesperges (see References) and this may well be the date of the original design, although it is know that Joseph continued to work in the rococo style into the 1760s and we also know that a number of versions of this model were made. Both Joseph Baumhauer and his son Gaspard Joseph Baumhauer used the stame stamp. Their German name may have proved too difficult for Parisian colleagues, because they simply used 'JOSEPH' between two fleurs de lys, which may reflect Joseph's appointment as marchand-ébéniste privilégié du roi in about 1749. The panels of lacquer are from an earlier piece of furniture, probably a cabinet, made in Japan ca. 1650-75.